Pin It Halloween is soon approaching so, how about another Halloweeny polish?! 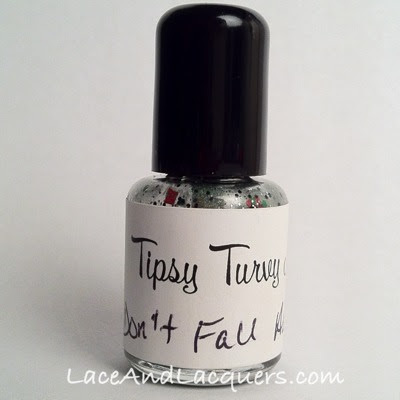 Tipsy Turvy Nails is a newer polish brand made by the sister duo over at Can't Hold My Lacquer! They have a good chunk of polishes in their store right now and I am excited to show you one from their Horror Series line! I feel kind of silly, I had been holding on to this baby for awhile because I thought it was a Christmas themed polish *embaressed* I've never seen Nightmare on Elm Street... so silly Lacey assumed from the colors and the name it was a Christmas polish. Glad I realized it sooner than later when I read the shop description! And here are the swatchessssss! Hey, it could work as a Christmas polish too! >.< LOL Anyways! The girls describe Don't Fall Asleep as "a light emerald green base with tiny silver, small black hexes, matte green hexes and matte red squares. It just screams 'Look, it's Freddy's sweater!!!'". I missed the connection LOL BUT! It is a pretty cool polish! You can find Tipsy Turvy Nails on Etsy, here! Full size polishes are $8.00 and minis are $4.00. To stay up to date on releases and more information you can find the Tipsy Turvy Nails Facebook Page, here. 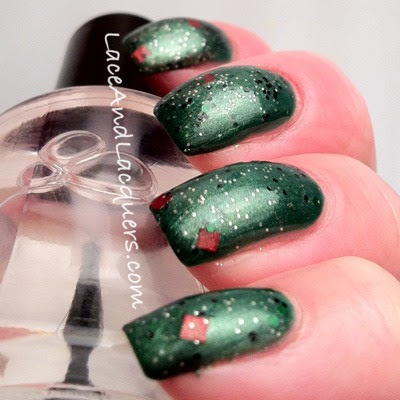 Also, don't forget to check out the girls' blog, Can't Hold My Lacquer, here! Have a great night! Mwahahahaha! I definitely thought Christmas when I saw the polish! Love! This would be perfect for christmas!